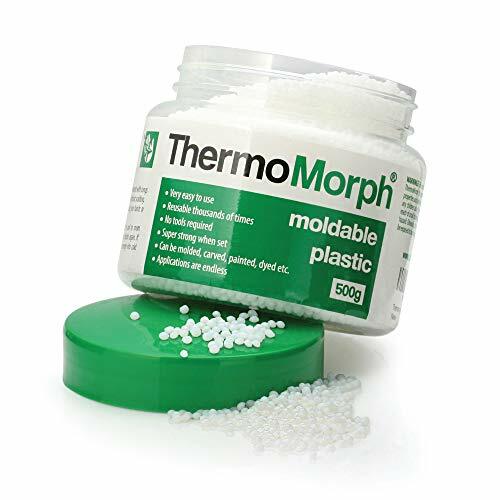 Thermomorph - Moldable Plastic Pellets 17.6 oz. ThermoMorph Advanced Modeling Compound. Moldable when warm, solidifies at room temperature Made of lightweight polyester thermoplastic Acts like clay when warm but as strong plastic once cooled Unlike other products that lock in shape forever once they are dry, ThermoMorph can be reheated over and over again and re-molded into any number of configurations. Extremely practical with hundreds of uses. Use ThermoMorph around the house for small DIY tasks. Create grips for Allen wrenches, stop small leaks, make brackets for walls, or add handles to cutlery. A perfect solution for professionals. Create props, masks, and prototypes. How to use: Heat water to 150+ degrees F. Pour ThemoMorph pellets into the water. Wait approximately two minutes or until white ThermoMorph pellets turn clear and stick together. Remove from the water, and get rid of any remaining liquid between the pellets. Form into desired shape with your hands, tools, molds, or any other means necessary. (Add food coloring if you wish.) Once your Polymorph creation is finalized, let it cool to room temperature and use. - Click the Add to Cart button today and start working on those odd jobs around the house you've been putting off! - STRONG, MOLDEABLE, REUSABLE - Acts like clay when warm but is as strong as plastic once cooled. Reheat to remold. Highly versitile! - GREAT PRODUCT AT A GREAT PRICE - Our customers have rated ThermoMorph at 4.8 out of 5 stars! Get the best product and the cheapest price per ounce. - SAFE AND RELIABLE - ThermoMorph is non-toxic and easily reusable. Just remelt, mold, cool, repeat!